The following articles, chapters and / or presentations have been prepared over the last year by current or past SAHA staff members, reflecting on SAHA research, programme activities and advocacy agendas. Keynote address at the 23rd Eastern and Southern Africa Regional Branch of the International Council on Archives (ESARBICA) General Conference, Victoria Falls, 8 - 12 June 2015. "Activating archives for justice: the TRC records and the duty to remember" Rhodes Journalism Review, edition 35. Read the news story on this presentation here. 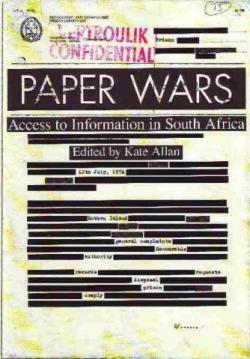 Published in 2009, Paper Wars reflects upon the work SAHA has done around testing the parameters of South Africa's freedom of information legislation.